Cult progressive rock band A.C.T. 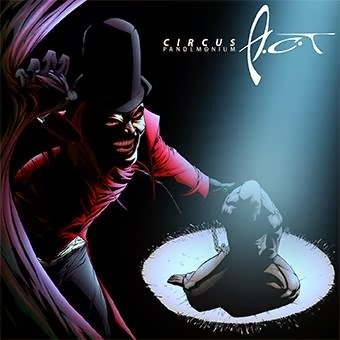 finally return with their long-awaited fifth album, ‘Circus Pandemonium’. It has been eight years since the Swedish quintet released ‘Silence’ back in 2006 and so their fans have well and truly been kept waiting. In fact, there was a period during which fans and commentators, myself included, began to wonder whether the band were still together. The music that A.C.T. offer is difficult to put into words, although the adjective ‘quirky’ is one of the most apt that I can muster. At it’s core though, and regardless of any genre labels one might wish to apportion, this is progressive rock of the highest order that blends many different styles into an homogenous and cohesive end product that will no doubt confound and delight in equal measure. Right off the bat, ‘Circus Pandemonium’ hit the mark with me. It was immediately obvious that I would like this record and so it has proved. However, by virtue of the variety and subtle complexity of the music, this is not an album that gets boring or predictable after a few spins. Instead, the more you listen, the more you discover and the more enthralled and captivated you become. One of the big strengths of ‘Circus Pandemonium’ is the lyrical content. In common with many other bands in the prog rock world, this is a concept disc, where each track acts as a chapter in the overall story. There are those who dislike concept albums and to be honest, this will have a bearing on whether you ultimately connect with this disc. Speaking personally, I love concept discs and this is one of the better ones I have heard in recent years, up there with Seventh Wonder’s ‘Mercy Falls’. The story revolves, somewhat unsurprisingly, around the goings on within a circus company with the central thread being the relationship between the cruel boss and the ‘Freak’, a poor unfortunate soul that is treated like an animal because of significant physical deformities. Some of the lyrics and spoken word segments are actually rather dark, unexpectedly so in actual fact. The result though is that I begin to find myself becoming actively involved in the story and empathising with the central figure. For me, this is the hallmark of powerful lyrics and here, they add real value to proceedings. The lyrical content may be commendable but crucially, it is backed up by some stunning music. To begin with, the musicianship is of the absolute highest calibre. Each member of the band is a master of his chosen craft, be it Ola Andersson on the guitars, bassist Peter Asp, Jerry Sahlin on the keys or drummer Thomas Lejon. The result is a set of songs that, on the face of it appear quite straightforward and immediate, yet are deceptively complicated and involved. Every note has been thought about in minute detail and is performed with the professionalism that many other bands would kill for. The production is just about perfect too – the mix allows each subtle nuance to be heard with clarity but overall, this is a rock-based record and the production provides the requisite power that such music needs. Herman Saming provides the vocals and personally, I really enjoy his approach. These days it is difficult to find a vocalist who can truly be referred to as unique, but this is one such singer. Saming’s voice is perfectly suited to such a varied album as he demonstrates his comfort with an all-out rock assault one minute and then a higher-pitched pop delivery the next. And, when required, his usually up-beat tone can drip with emotion and authenticity. To make reference to all of the influences at play on this album is, to a certain extent, an exercise in futility but I shall try to give it a go. Naturally, there’s plenty of circus-inspired themes given the story, as evidenced in ‘The End’ for example. There’s a reggae vibe to ‘A Truly Gifted Man’ which ends in rousing fashion whereas ‘Look At The Freak’ calls to mind Queen or E.L.O. at their most theatrical, bringing a touch of the West End stage with them at the same time. ‘A Mother’s Love’ is a piano-led ballad that has echoes of 80s pop about it but which is beautifully emotional whilst the cheeky beat to ‘The Funniest Man Alive’ will have fans of all ages dancing a jig around their living rooms. Then there’s the opening riff to ‘Lady In White’ which would be comfortable on many a metal album, as would the ferocious drumming within the closing moments of final track ‘Freak Of Nature’. The band’s own Facebook page also mentions acts like Styx, Rush, Kansa and The Beatles. Normally such things should be taken with a pinch of salt but, in the case of A.C.T., there’s a strong case to say that these references are absolutely spot on and to a greater or lesser extent, there are elements of each to be heard on this record. But above all and arguably more importantly, each and every track, be it a full-on tack or a brief instrumental interlude, offers something very special. In particular, the melodies throughout are stunning and will stick with you for days on end. Just listen to the choruses to ‘Lady In White’ or ‘Manager’s Wish’ for examples of this. I have really struggled with this review and I’m still not entirely happy that I have done ‘Circus Pandemonium’ sufficient justice. However, put as simply as I am able, this is art rock at its very best. Progressive in nature, it flits from idea to idea with gay abandon but manages to keep the central core intact, namely creating memorable music that defies labels but which is memorable, entertaining and technically superb. You can’t do that and pull it off so sensationally well without being a very special band indeed. And that’s exactly what A.C.T. are: a very special band indeed.